My sister's baby shower was yesterday and as you probably guessed, cookies were required. 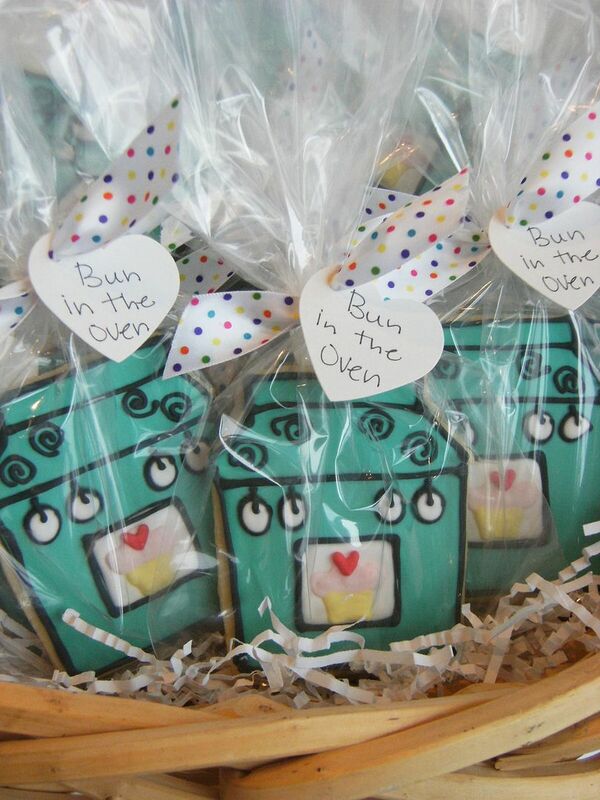 These "Bun in the Oven" cookies were the favors. The idea for these cookies came from this card I bought a few years ago at Target. My husband made a template from my sketch for the cutter out of a manila folder. I loved the pink on the card, but my sister doesn't know if she's having a boy or girl. I went with turquoise ovens...I wanted them to look a little retro and turquoise seemed to fit the bill. I think these would be really cute in yellow, too. A few days before making the cookies, I made the buns. 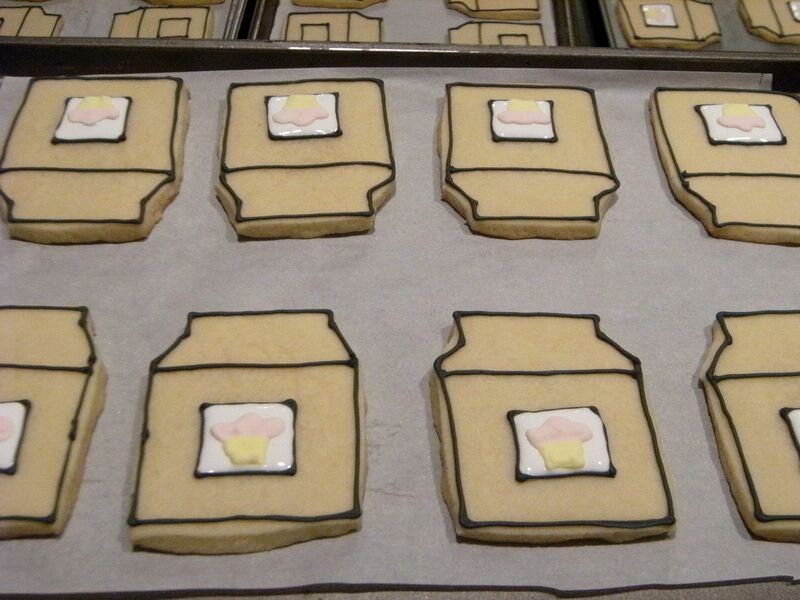 They are made the exact same way that you would make a royal icing monogram. (Click here for more info.) They store perfectly at room temperature. Run a rubber spatula through the icings to pop any large air bubbles that have formed. Transfer to squeeze bottles. 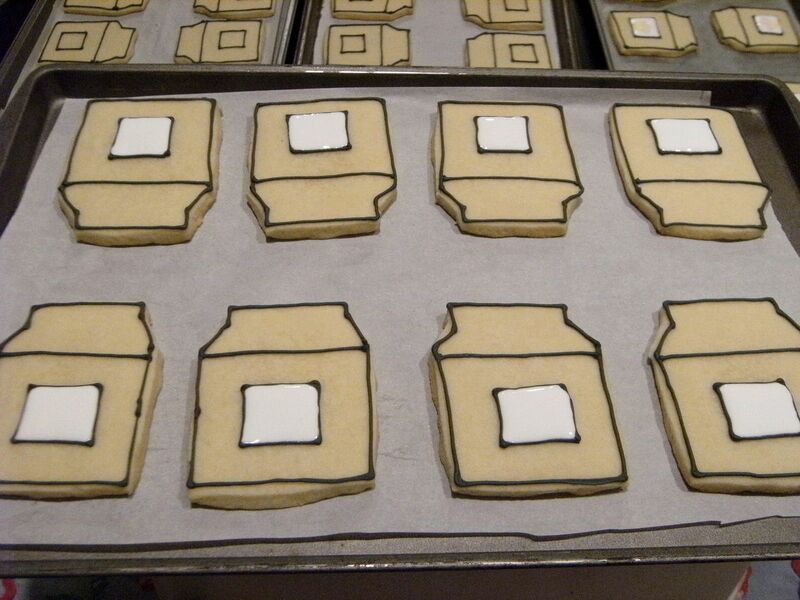 Fill in the "window" in white flood icing. 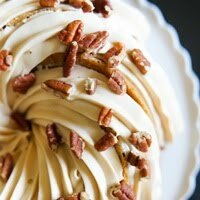 Add pre-made "bun" on wet icing. Fill in the remainder of the oven in turquoise. Let sit for at least one hour. 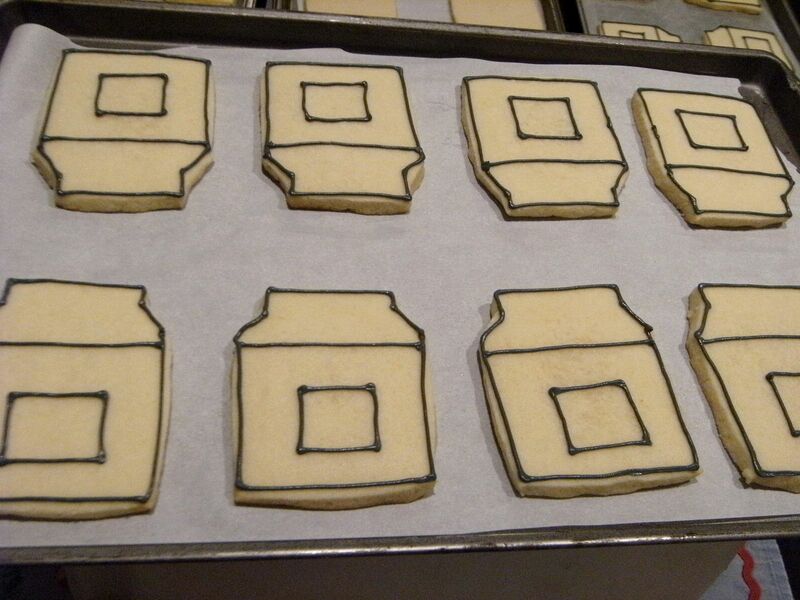 Using a #2 tip, go back over the black outlines of the oven. Add circles for knobs. 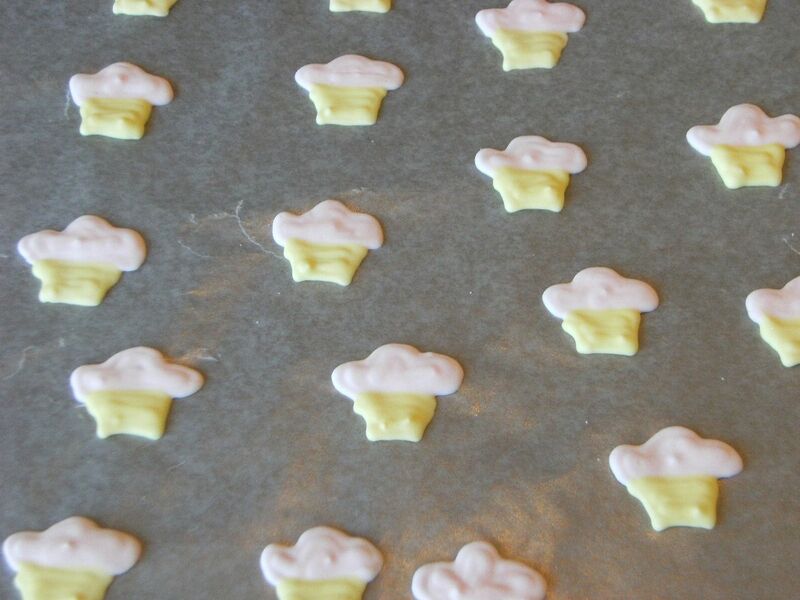 Fill the knobs with white flood icing. Change the black tip to a #1. Add burners to the oven and detailing to the knobs. I was a little nervous that people wouldn't know what the cookies were supposed to be, so I found some little heart-shaped tags and added them to the ribbons. These are perfect baby shower favors! what a neat idea! Love these!!! Aww..Bridget these are so cute!! What a great idea for a baby shower! OMG....hands down the cutest cookie you have made!!!!!!!!!!!!!! What a great idea! These are perfect for a baby shower - I'm sure everyone will just love them!! You are SO talented! What a great idea!! I love the step by step pictures - but I know my hands aren't as steady as yours! WOW! OMG ~ THESE. ARE. AWESOME. Would you mind if I stole this?! Cute! 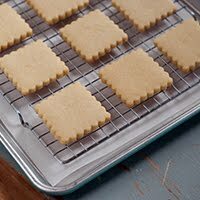 I admire you for so often cutting the cookies without a cutter. I bake a lot..and cookies often. That just seems really, really hard to do.Does it get easier? 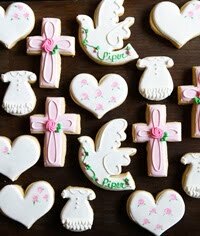 My sissy would luv it if I made adorable cookies like that for her baby shower! You are amazing Bridget! OMG! These are beyond adorable!! You are SO creative. Love this. When I was pregnant w/my third during Halloween--I was an oven! These are so adorable Bridget! What a great idea!! I bet the guests went crazy over them! These were perfect and darling! Thank you for making them for my shower! I am lucky to have such a talented sister! Beyond cute! I love something unexpected, and this is Perfect for a shower! Bravo, you! Oh so cute and different! You always have the cutest stuff! What a great idea! Super cute! Love the idea. Do you have atip for changing from #2 to #1 tips without the mess? Or do you actually just use a separate pastry bag? Have you thought of writing a book? I keep saving all of your post, like this one, for "someday"! So original and so adorable!!! I love this idea! It is so original and perfect for a baby shower. Adorable! How I wish you could be here in Rhode Island for Drop In & Decorate, to show us a thing or two. These are absolutely adorable!! Thanks for sharing! Precious cookies! Thank you for the step by step details. Love your blog!! These are too cute!! What a fantastic idea and they turned out perfect! Great job! Brooke...are you using a coupler? If you do, changing the tips is easy, just unscrew the coupler ring, take off the first tip, put on the next one and replace the ring. Even if I'm only using 1 tip, I always use a coupler. so so sweet! love it! you never cease to amaze me with your talent! Bridget, These are absolutely adorable! The step by step is really great. 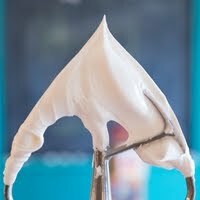 I'm always amazed at how smooth and perfect your icing looks! These are so wonderfully creative!!! You are a trend setter girl! these are great! What a great sister you are! They came out so perfect! Amazing work Bridget! I love your creativity and willingness to share your ideas. Thanks so much! You can definitely tell what they are - they are gorgeous! And I love your new step-by-steps. that is the cutest idea ever. You are amazing! You REALLY outdid yourself on these! Completely inspiring. And congrats to your sis! These are so adorable! 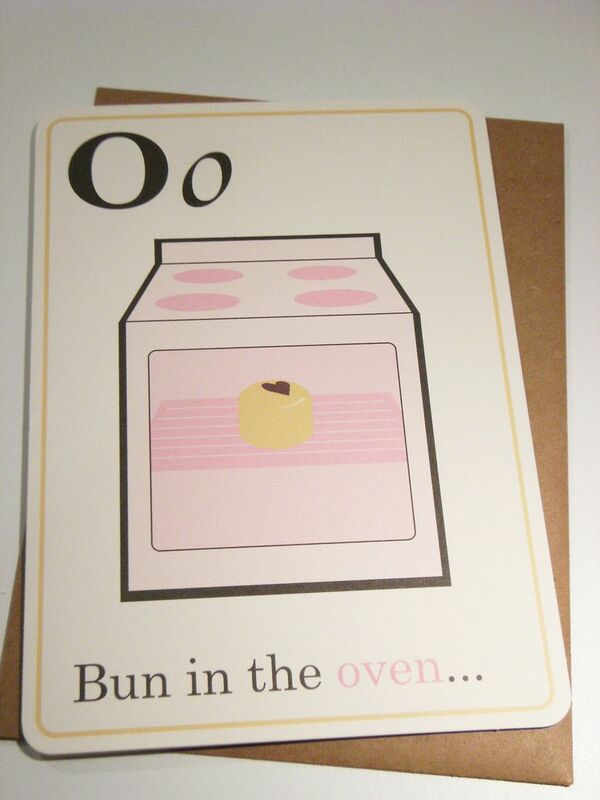 I just bought a card for a friend at Target that says "bun in the oven" and it has a little smiling cinnamon bun - so cute! I LOVE this idea and you executed it so beautifully! 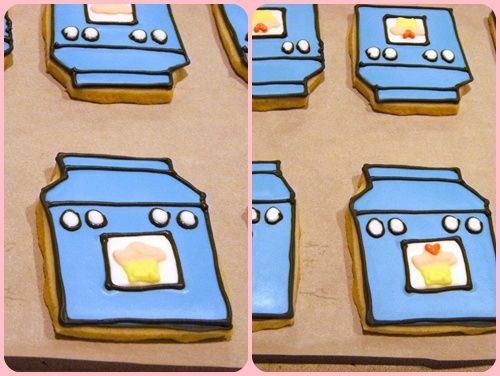 Oh my gosh- these are seriously the most adorable cookies I have EVER seen!! They make me want to have a baby just so I can have these at my shower!! LOL! Bridget Bridget Bridget! Just when we think you'll never be able to top (any last idea), you pull yet another darling trick out of the box! 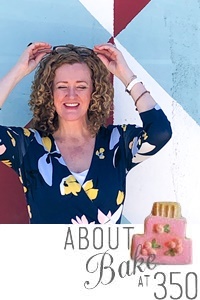 Her blog posts before and after that one show some other cute details she did to carry out the "Bun in the Oven" theme. The two of you gals are incredible! Keep up the amazing tricks! Absolutely adorable. You'll have to create a version with a pink oven. 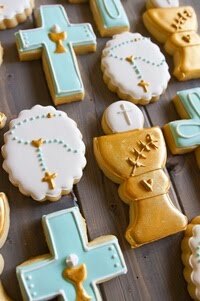 They would have been perfect for the dessert table I designed for a baby shower. These are adorable! I need someone to get preggers now so I can make them! Love these and the your details on creating them! Your cookies are AMAZING! I do cakes and cupcakes and just got a call for some cutout cookies with a company logo on them, of couse I said sure I can do that!! I hope mine turn out half as good looking as yours do!! Thanks for the inspiration!! 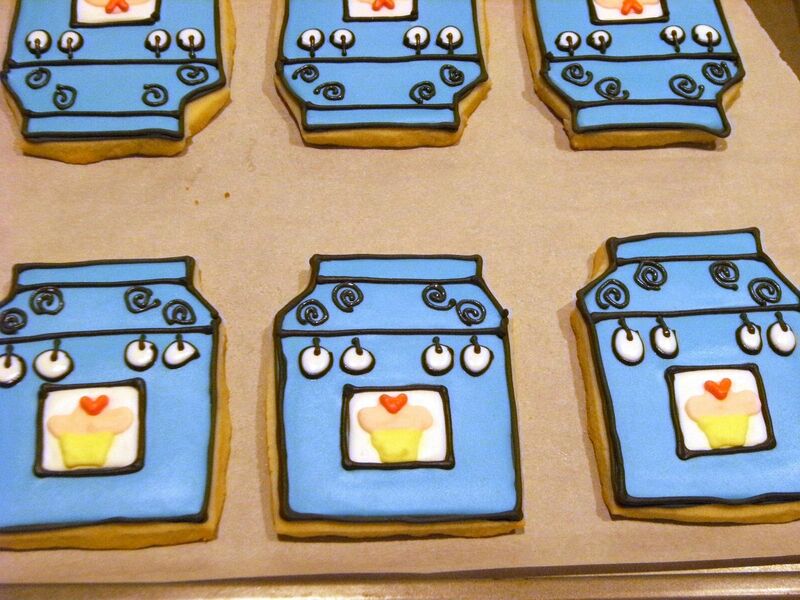 those are just the cutest cookies I've ever seen. I may have to make my own version. I love love love the idea!!! Hahaha these are soo adorable!! Love the buns! These are so adorable!!! 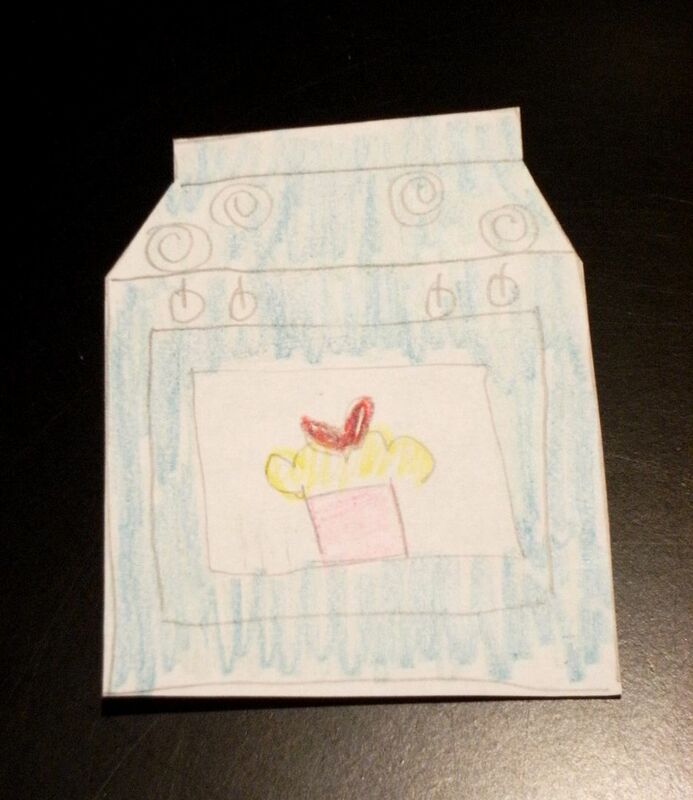 I would really like to make an apron for a friend who is FINALLY pregnant, and I want to embroider this bun-in-the-oven design on the front. 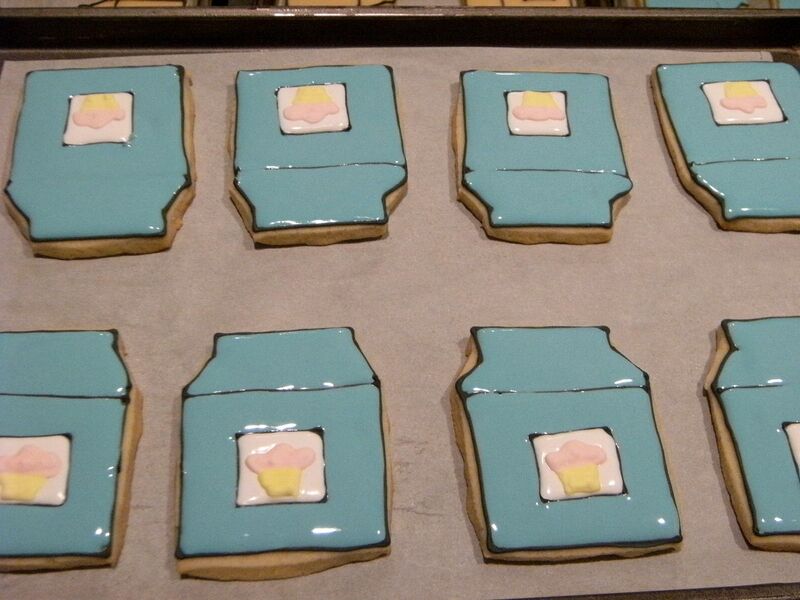 I will be sure to credit you, saying I got the idea from these cookies. Would you mind at all?! Hi Bridget! I just wanted to thank you so much for this cute idea. 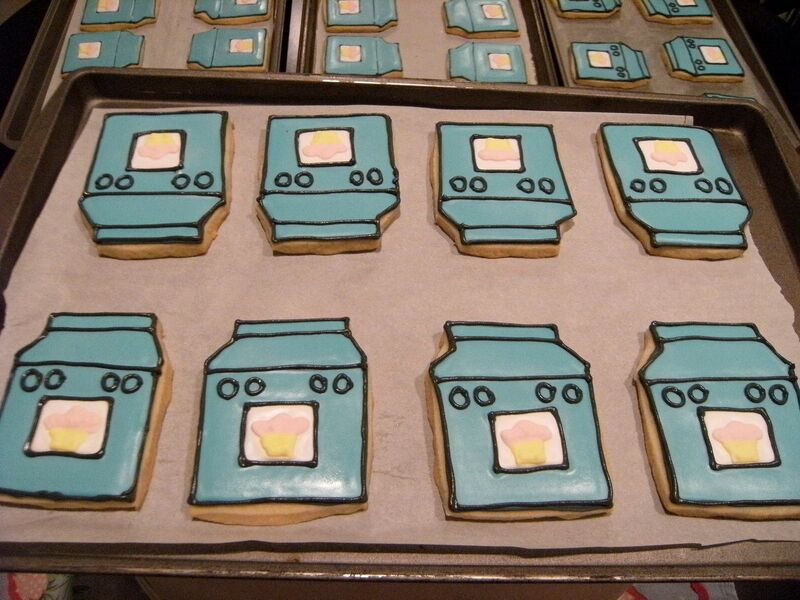 I made the "Bun in the Oven" cookies and some of your "It's a boy" cookies for a baby shower recently (just posted some pics on my blog this week). Everyone loved them! 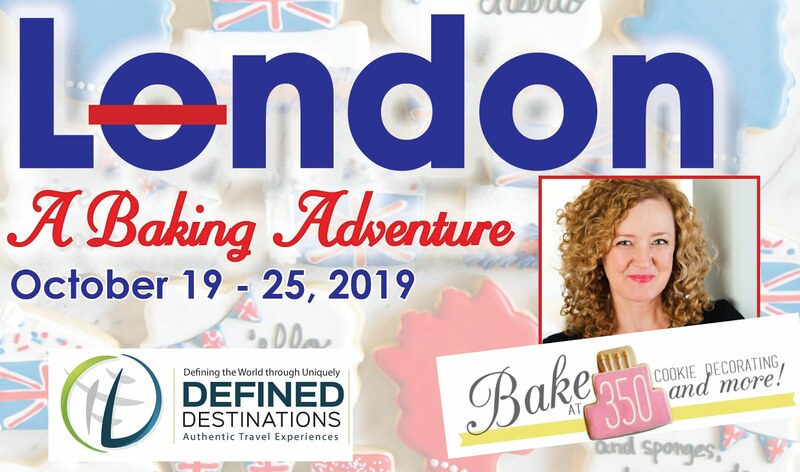 Thank you for continuing to provide thoughtful and inspired ideas! 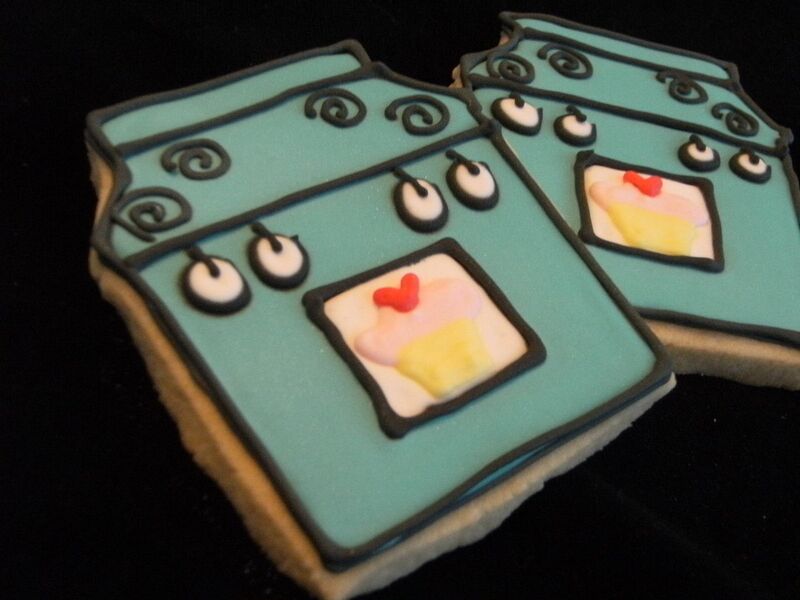 I don't use the word "cute" very often, but I would definitely use it to describe these cookies. I love all the details that you put into them. Impressive. 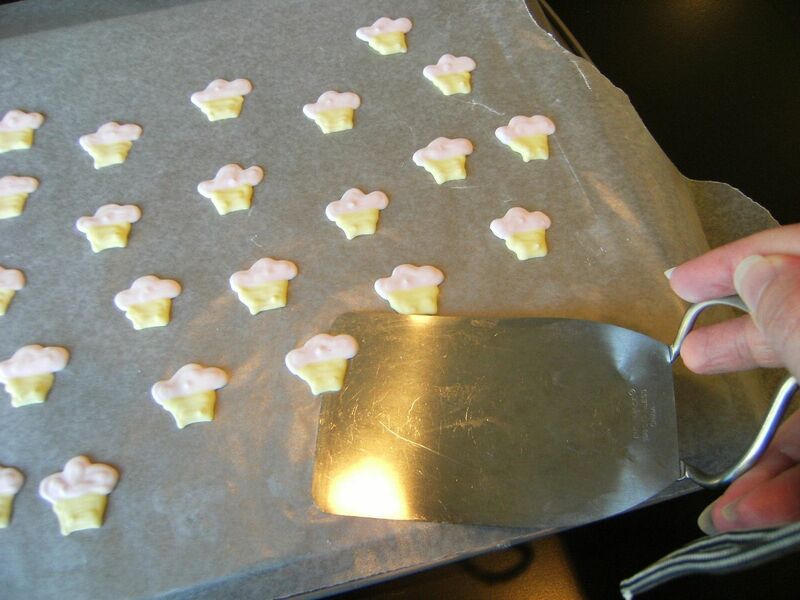 Where did you find an oven shaped cookie cutter?! I'm having 0 luck.